Hymns and shock after Notre-Dame fire Jump to media player People gathered in disbelief as they watched the 850-year-old Gothic building burn. 'We will rebuild this cathedral' Jump to media player President Macron says Notre-Dame will be rebuilt after a huge fire destroyed a large section of the cathedral. Notre-Dame: Cracks in the cathedral Jump to media player Parts of Paris's 850-year-old Gothic masterpiece are starting to crumble, because of pollution eating the stone. 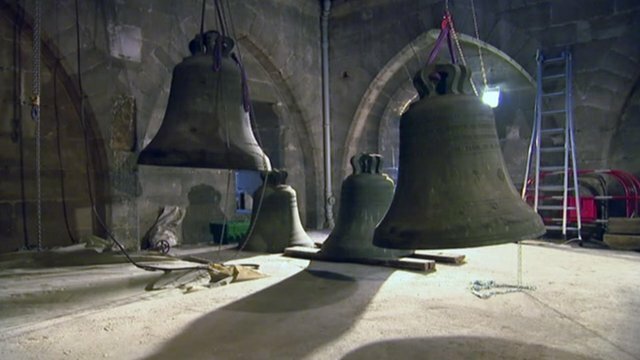 New Notre Dame bells blessed Jump to media player Eight of Notre Dame Cathedral's nine new bells have been blessed by French Cardinal Andre Armand Vingt-Trois. Notre Dame celebrates 850 years Jump to media player Notre Dame cathedral in Paris is due to celebrate its 850th anniversary, with the start of a year-long festival. A huge fire has broken out at Notre-Dame Cathedral in Paris. The fire department said a major operation was underway at the medieval building.